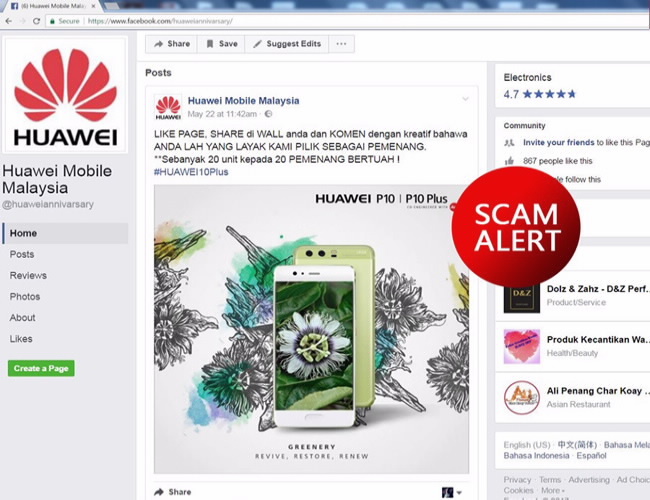 We, HUAWEI Technologies (Malaysia) Sdn Bhd (545949-D), have been made aware that there is a scam Facebook page (https://www.facebook.com/huaweiannivearsary) which has been circulating in Facebook claiming that in conjunction with HUAWEI celebrating its 10 years anniversary, HUAWEI will be offering twenty (20) units of HUAWEI P10 Plus smartphone to twenty (20) lucky winners by simply like the page, share and comment “Saya Nak” on the facebook wall. We hereby confirm that such contest / promotion is not organized by and has no relation to us and any of our affiliates. We would like to caution the public to keep vigilant and take reasonable precaution when encountering such website as participation (in such website) may result in identity theft or other fraud. We are pleased to advise our valued customers to contact 1800 22 00 86 for verification regarding our current official contest / promotions before participating in it.